I want A Bagful of Colours to Spring into Summer! When comes to handbags and shoes, the rule of thumb is The More The Merrier. Which I never doubt about it, tell me how could a girl resist handbags and shoes? This is the style story of Girlish Fun with Carlo Rino Spring Summer 2014 Collection. Well, for this season Carlo Rino collection exudes a classy and more refined with hints of girlish, fantasy and fun. As usual spring and summer are splash with more vibrant and pastel colours. It’s a happier season of the year why not be more daring to carry colourful handbags and walk in vibrant shoes. Carlo Rino is bringing back the fun, feminine, glamourous, glitzy and gorgeous into life. The highlights for Spring Summer 2014 are Vivacious Valentine, City Chic, Cut Out For Love, R For Red, Cute Carry-Alls, Graffiti Gorgeous, Quilted Quirky, Sensational Slings, Mini Must-Haves and the Wallet Wanders. Oh yes! not forgetting Carlo Rino’s shoes. I have two pairs of Carlo Rino’s shoes; one is pumps and another is the casual wedges. They make me walk and look taller without causing any tiredness to my feet. Its comfy and I love the soft cushioning insoles. Do it with style and show off your attitude! 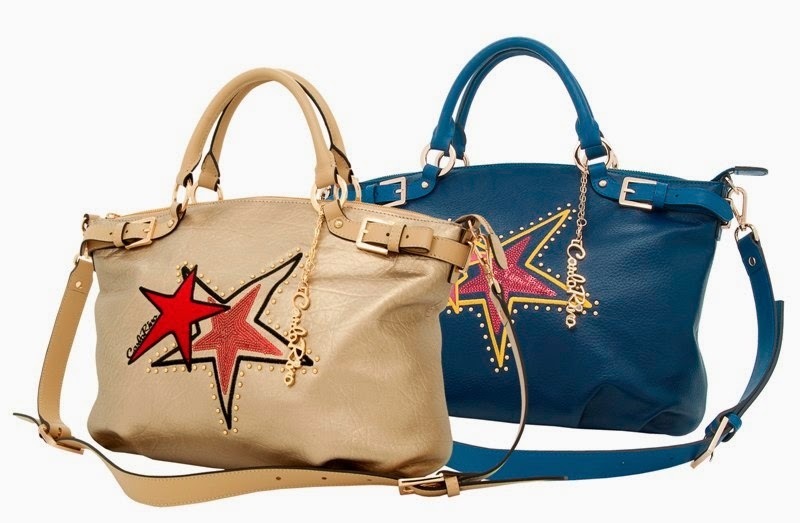 I spotted this Carlo Rino Graffiti Gorgeous Stars arm held and shoulder slung with detachable straps totes in cream and navy blue. Both colour are equally attractive. It's chic and hip at the same time easy to match, ts quite roomy too. I like it! Sarah, no i chose the pumps and wedges.